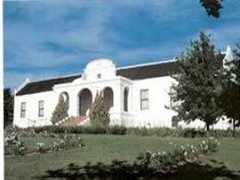 De Oude Drostdy was designed by the renowned Cape architect Louis Michel Thibault and built shortly after the establishment of the district and town of Tulbagh in 1804. When the seat of the landdrost moved to Worcester in 1822, De Oude Drostdy passed into private ownership. Over the centuries, the building has withstood the ravages of gusting winds, torrential rains and a devastating earthquake in 1969. It was restored to its original graceful dignity by the National Monuments Council. 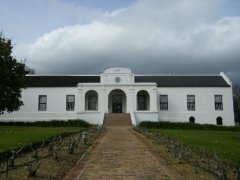 Today De Oude Drostdy has a dual function: it is museum with a comprehensive collection of early Cape furniture and household items, and it is also a unique venue for wine tasting. The reverential atmosphere of the museum makes a tasting at De Oude Drostdy a singular experience … after descending a steep, narrow staircase to the historic underground slave quarters, the visitor is welcomed by candlelight and wine barrels displaying the range of red and white Drostdy-Hof wines and sherries.